Liam Devlin is an Irish patriot. He was a champion of the Irish cause from his earliest days, fighting against British rule in Northern Ireland. He took his freedom-fighting stance to Spain during the height of their civil war where he fought on the side of the anti-Franco forces. 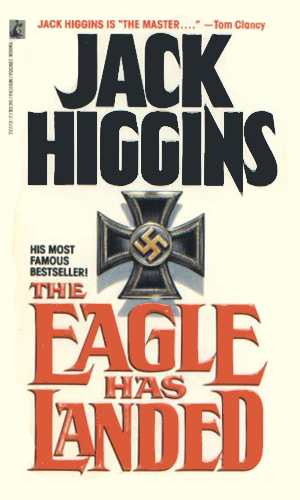 His help was then enlisted by a force that seemed incongruous to his earlier struggles, the Nazis, but since they were both fighting the British, he agreed. Devlin is a ferocious fighter for his nation's freedom. He is also a poet, a writer, and an intellectual. After his years of struggle, as he grew more disgusted with the indiscriminant killing by the new IRA, he retired from the conflict and became a professor at Trinity College. It is while there in his mid-60's that Devlin is approached to help his former enemy, the British Charles Ferguson. As the head of Group Four of MI-5, he twice coerced Devlin into helping his team. Even though they were politically opposite each other, there was considerable respect by Ferguson for Devlin. This series is really two separate series as there is a thirty-four year separation in time. The first pair of stories concerned the actions of Devlin in his helping of the Germans against the British, all in reprisal for Britain's continued dominance in Northern Ireland. In both efforts, he shared the stage with a German colonel named Steiner. They are awesome tales though they are more war stories than spy stories. The second pair, happening in the late 70's and early 80's, are a wholly different matter. Devlin is an impressed agent for Group Four of D-15 (disguised MI-5). The work is just as exciting but the feel is understandably not the same. A German plot to eliminate Winston Churchill joins a paratrooper Colonel Steiner and his men into northern England to work with Liam Devlin. 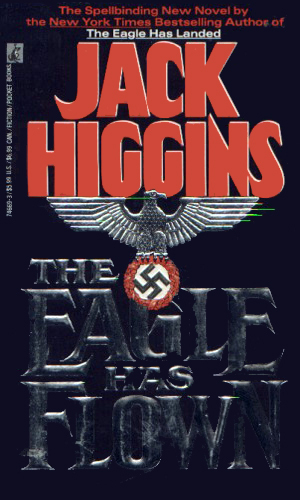 This novel marked the transition of Jack Higgins into the best seller category. It was also turned into a fantastic movie in 1977 starring Michael Caine, Donald Sutherland, Donald Pleasance, and Robert Duvall. Reichsfuhrer Himmler wants Steiner, known to be held as a POW somewhere in England, back and sends his best espionage agents to free him. 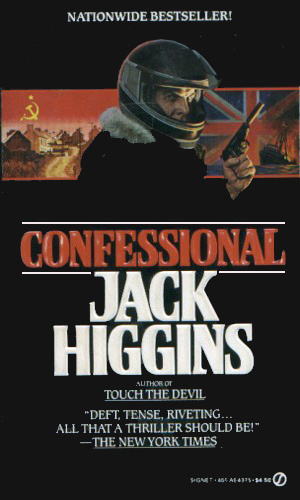 When an assassin for the KGB is found to have stolen vital NATO weapons secrets, British Intelligence needs someone who can think as deviously as the Soviet to catch him. Their selection is Liam Devlin but his cooperation is not coming willingly. A deep sleeper agent, planted by the KGB in Northern Ireland many years before, has awakened and is on a mission to kill one of the most beloved people in the British Isles. While the plans of the Soviets have since changed, the intent of the sleeper has not. Unless someone can root him out, the turmoil is escalate to a new level. Ferguson's choice for the job is Liam Devlin. Two movies have come from this four-book series. 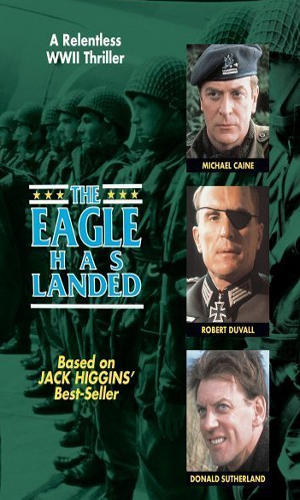 The first, and more famous, is The Eagle Has Landed with Michael Caine and Donald Sutherland. The other is Confessional which starred Keith Carradine. The Germans plot to kidnap Winston Churchill when he visits a small village. They are aided by an angry Liam Devlin. A terrorist is determined to destroy the peace talks between the Irish and the British. He is being pursued by both sides as he aims to kill the pope and pin it on the British. As stated above, this could almost be considered two two-book series, so different are they in time and attitude. You need not read the first two to appreciate the latter two, or vice versa. Truly, however, you should read all four because they are great! When you do read them, read the two sub-groups in order, though. That is, read The Eagle Has Landed before The Eagle Has Flown and read Touch The Devil before Confessional. It is is not vital but it would add to the enjoyment. This series is also tied in closely with the Sean Dillon series. 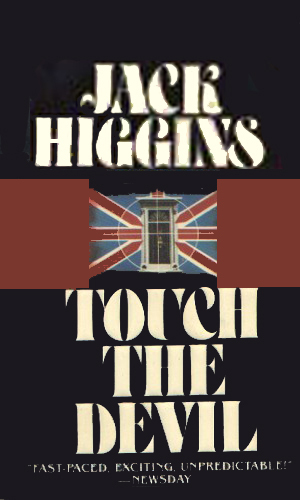 The man who entices Devlin into helping the British, Brigadier Ferguson, is the same man who fights and then extorts Dillon into working for him years later. Additionally, in several of the later Dillon books, he employs the help of the aged Devlin in fantastically enjoyable ways. Most enjoyable is the way that Devlin and Dillon are both fighters for Ireland though from different generations and different attitudes as to how the fighting should be done. Amazingly, in the storyline, they both work for a man they previously fought, Ferguson, because there are far nastier people around.